Stunned and breathless, maybe that's the first thing you do upon arriving at the island of Socotra, Yemen. The island has more than 800 species of rare plants and unique guaranteed. 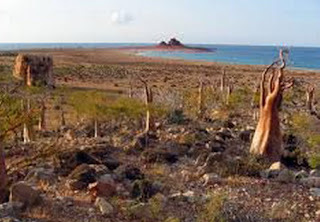 Socotra island became one of the popular tourist attractions in Yemen. An unusual sight greeted every tourist who arrives on the island of Socotra, Yemen. This island is unique and special because it is inhabited by hundreds of rare plants. That makes more unique, rare plant has an unusual shape. Do not believe it, come directly to the island of Socotra. Socotra Island is a small archipelago of four islands in the Indian Ocean near the Gulf of Aden, Yemen. More precisely, about 250 miles off the Coast of Yemen. Just like the Galapagos Islands are home to many endemic species, the island of Socotra is also filled with many endemic species, especially plants. There are about 825 species of rare plants, and more than one third are endemic. Socotra is also filled with lots of snails and reptiles, 90% of whom will not be found elsewhere. More and Socotra unique ecosystems and stunning in the presence of 253 species of coral, 730 species of coastal fish and 300 species of crab, lobster and shrimp in the waters of the sea. Socotra Island will be a unique and memorable destination for the traveling enthusiast. Upon arrival, the tourists are immediately confronted with hundreds of species of plants are definitely unusual. Attracted the most attention is its shape. Instead of a tree that is often seen to have twigs and leaves that meet almost half the weight of trees, do not hope you can find it here. Trees on Socotra has branches that are upright, with leaves that grow only on the limb. The form was weird, there is a bulge in the lower limbs, there is also a large trunk at the bottom but once looking up, the trunk split into several parts. If it is observed more in, a tree that is in Socotra, much like a giant bonsai trees. Unique but beautiful. But only one thing attracted the attention of every tourist who was in Socotra, the presence of plants. One of the most striking is the Dragon Blood Tree or Dracaena cinnabari. This tree very weird because has a shape-like umbrella. Blood named Dragon, as the sap of this tree is red. 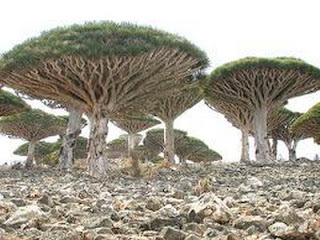 The first inhabitants in the sap of this as a call Socotra dragon's blood. This tree is also called Dragon Blood tree. Another tree that is unique and endemic to Socotra is a tree-type sukunan breadfruit, giant cucumber tree, pomegranate trees are rare, and typical of Socotra desert rose tree.